April | 2011 | Stand Up and Speak Out! Butler University has an enrollment of under 5,000 students, yet almost everyone in America has now heard of it. Unless, of course, they don’t watch sports or have been living under a rock. For those people, Butler is located in Indianapolis, Indiana. Sure, we were disappointed, but we were still very proud of the Bulldogs. I was especially proud that they were so close to winning because it showed, like the rest of the tournament, that we could run with the big dogs. Few thought that the 2011 tournament would see the Bulldogs play in it, let alone go all the way to the championship again. Butler’s regular season was less than perfect, and they were the second seed in the Horizon League, yet they got a bid to play. Many were shocked when they upset 1-seed Pittsburgh but the shock grew to excitement with each game the Dawgs played. It was blissfully unbelievable for a team that, two years before, hadn’t made it past the Sweet Sixteen, to be playing a second national championship game. Again, Indianapolis rallied around the Bulldogs. The line at the Butler Bookstore wound throughout the space. People were waiting an hour just to purchase some Butler merchandise. The morning the team left for Houston (it was early morning, too, long before the sun was set to rise), a thousand people showed up to Hinkle Fieldhouse to send them off. The night of the championship game, Fred and I went to a pub in Broad Ripple, an area of town not far from campus that is popular with the college kids for all its bars. The pub was full with people wearing Butler gear, every television turned to the game. Together we ate, drank, and yelled at the screens. The closer we got to the end of the game, the more heads I saw bowed in the bar. It was a tough game to watch, with or without alcohol. Again, for those of you who don’t follow sports, Butler lost. Bad. It wasn’t like last year, where we were so close that one basket could have made a difference. “Take me home and hold me,” I told Fred. We both needed consolation. The next day, I read an article online that made the Butler pride shine again. After the loss, the locker room was somber, as one would expect. The seniors were especially taking it tough. But they literally pulled each other up, embraced each other, and reminded themselves that they are a team unlike any other, whether they win or lose. The game isn’t about who missed what shot or who got fouled out; it’s about selflessness. It’s what makes the Butler Bulldogs stand out from the other teams and what got them to two national championship games. 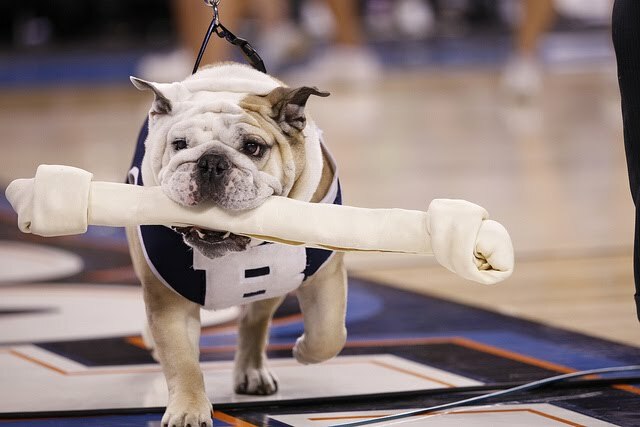 I am a Butler Bulldog and I will always be proud to be one, whether my team makes it all the way to the championship game or doesn’t even get a bid into the tournament.